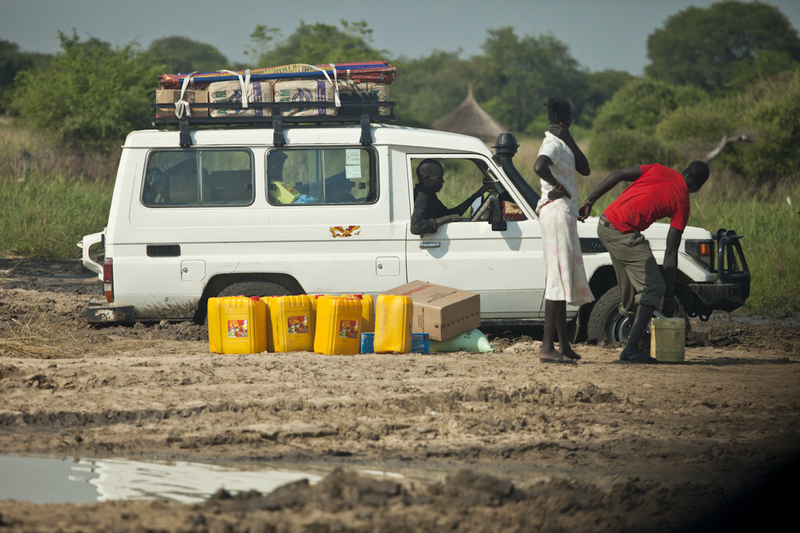 Today I was involved in two separate car accidents in South Sudan. Most of us are bruised and sore, especially on the knees and shins. Also, there’s damage to the vehicle. The only thing is, each of the accidents lasted two and a half hours and we were the only vehicle involved. What we hit was the Juba-Bor road. 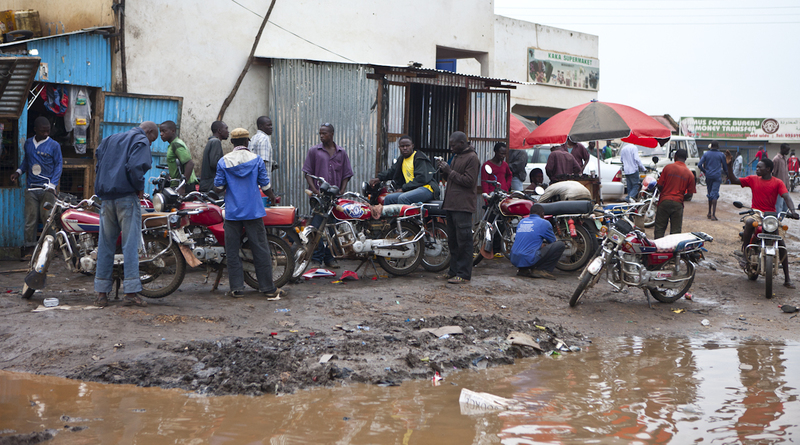 The rainy season has just ended, and the road can no longer be considered a road. As they say; in America your drive on the right side of the road, in Britain on the left, and in Africa you drive on the good side of the road. 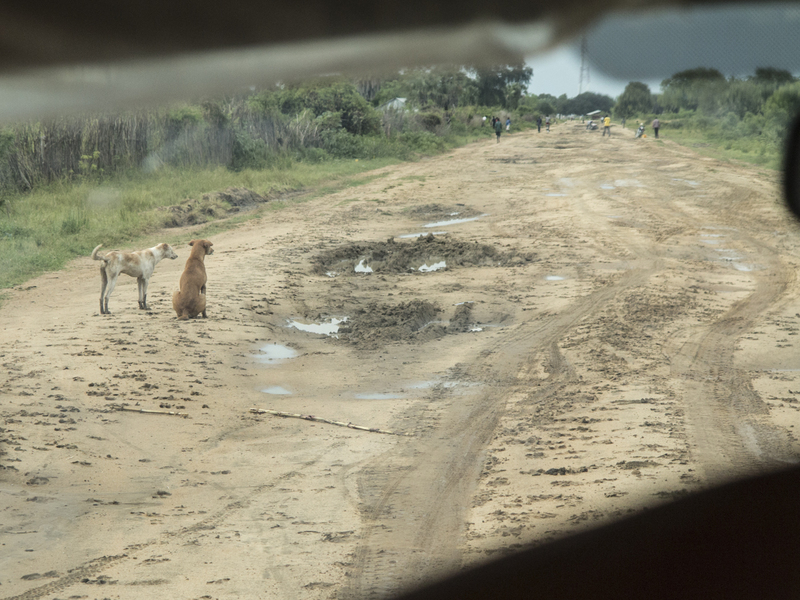 This of course doesn’t apply to South Sudan, where there is no good side of the road. Each way to the village we went to was only 30 or 35 miles, but took 2 1/2 hours to travel. 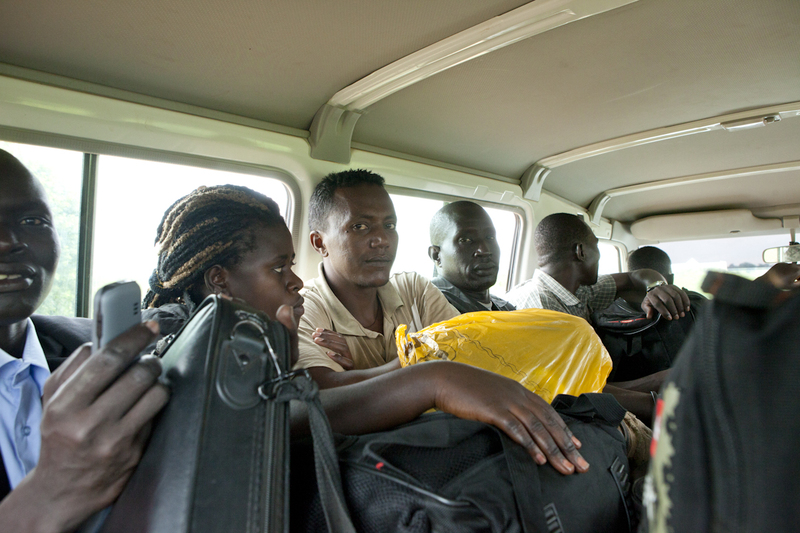 Going the 140 miles all the way to Juba currently takes 2 days. The good thing is that the reason for this transportational fiasco was that we were going to a Baptism at a year old church that meets under an acacia tree in a village along the Nile. It doesn’t get any better than that. 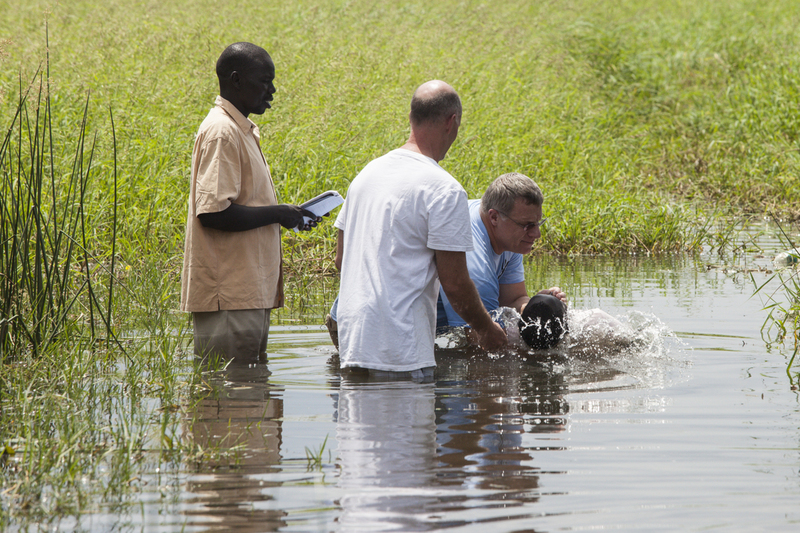 Imagine yourself in the time of Christ, in the land of Cush, along the same Nile River where Moses floated in a basket. Now realize that except for the odd T-shirt or other western clothing, and the fact that the well has a hand pump instead of a bucket, NOTHING has changed since that time. The event was as amazing as I thought it would be. A line of people walked from the church down to the river, singing as they went. It was just like the scene in “Oh Brother Where Art Thou“, only it was all Africans singing in Dinka. The villagers continued to sing the whole time as they stood along the shore, and the music was beautiful. I wouldn’t have missed it for anything in the world. Afterward, the chief greeted us and thanked us for being there, and expressed his appreciation for our participation in their village. I was here a year and a half ago, and I sensed a lot of skepticism at the time that we would actually continue to be involved as we said we would. I think there was some appreciation that we had followed though and continued to build relationships in this village. In the end, the bruises and soreness were worth it. This is a beautiful day I will always remember. 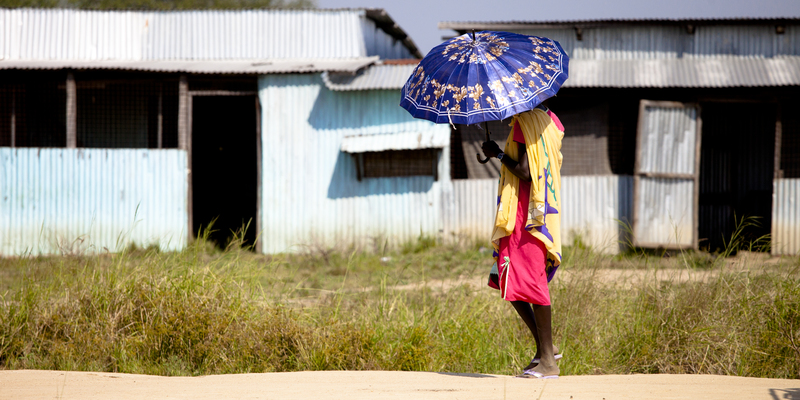 Every time I go into South Sudan, the scariest but also the most exciting part of it is the travel. It is definitely the most dangerous time, but also gives me the chance to see some truly amazing things, as well as live some experiences that are rare for the westerner. I’ve learned a few things over the years about what to do and what not to do. The first time I went, we hired a car to take us from the capital to the village we were going to. While this made the experience far more comfortable, it also made it extremely expensive and not necessarily any safer. The secret is out that UN workers are given a per diem of $220 US dollars a day. Consequently the rates for anything consumed by westerners is through the roof. Hiring a car costs $500 US dollars a day, plus gas, which is currently somewhere between $15 and $18 dollar a gallon. The driver somehow managed to fit 14 people into this land cruiser, plus all their stuff. Since then, when possible, we travel by public transportation. 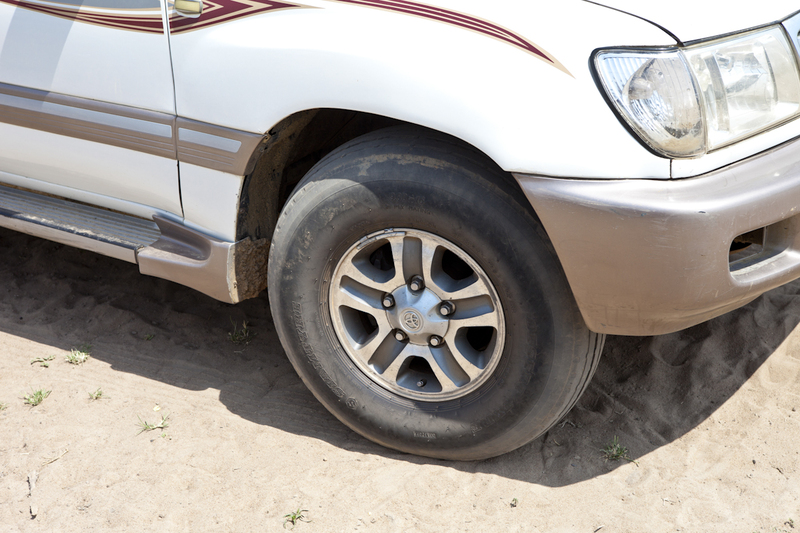 While all of the comfort is gone, we end up spending $30 a person instead of $125, and since the vehicles make regular trips, they are usually more rugged, typically Toyota Land Cruisers. The problem is, just when you think the driver can’t get a single additional person in the vehicle, two more get on, literally. You have to hold yourself up on your elbows to keep from getting beaten up by the jarring over rough roads. If you want a real African experience, this it. While this is a rough way to travel, I have an appreciation for it coming from a culture where comfort is placed on such a pedestal. We could use a little more “let’s do what we need to do to get it done” attitude in the US. Vehicles stopped at a checkpoint where mines are being cleared. 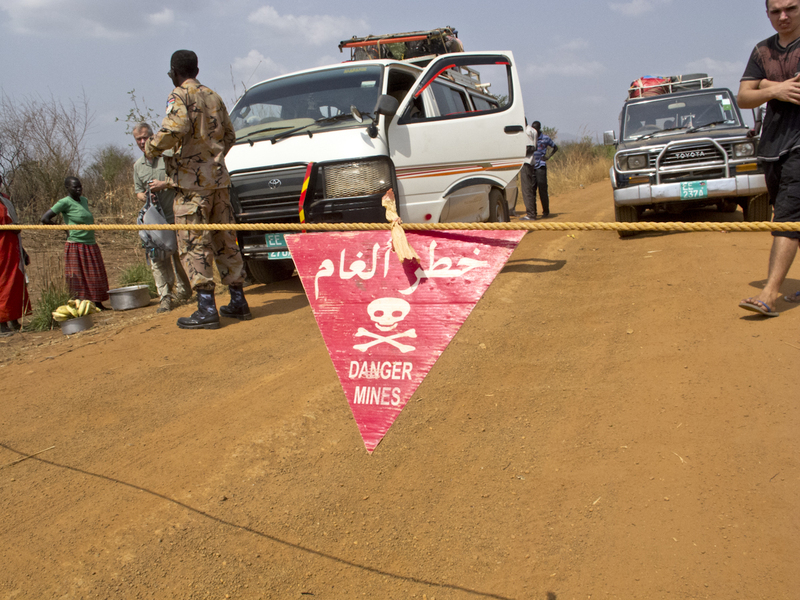 One of the dangers I mentioned is that many sections of road are still lined by minefields. A couple times we’ve had to stop and wait while mine clearing equipment finished what they were doing before it was safe for traffic to pass by. Additionally, there is a lot of unexploded ordinance along the side of the road. But the tradeoff is what you find along the way. 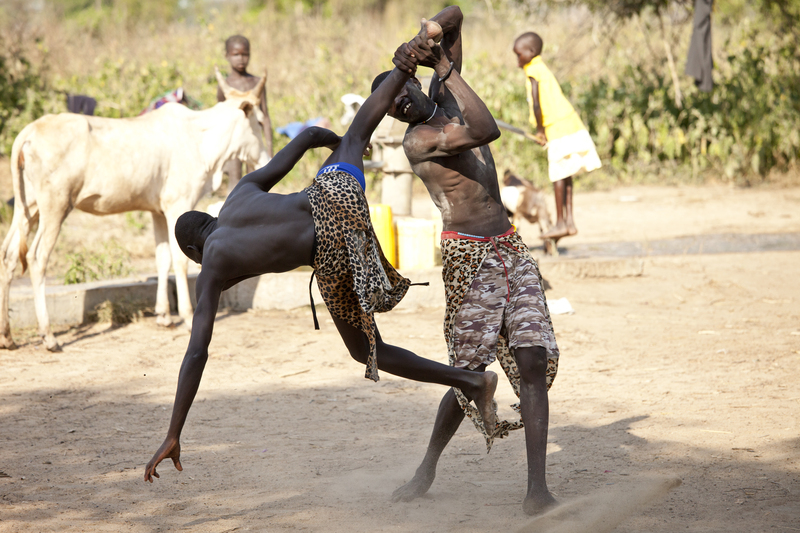 Once when traveling between two villages, we came across two cattle camps engaged in wrestling. I was fortunate enough to be able to stop and get some of my favorite pictures to date. This was a very rare thing for anyone not from South Sudan to see. Sudanese wrestlers less than a second before the match ended in pain. Another of the dangers I mentioned is what the locals call “black snakes”. No, they are not literal snakes, though there are plenty of those. Black snakes are bandits and murderers who ambush drivers on the road, shoot the passengers, then pillage the vehicles. These are some of the people that benefit from the current state of war and chaos, and further destabilize the situation. 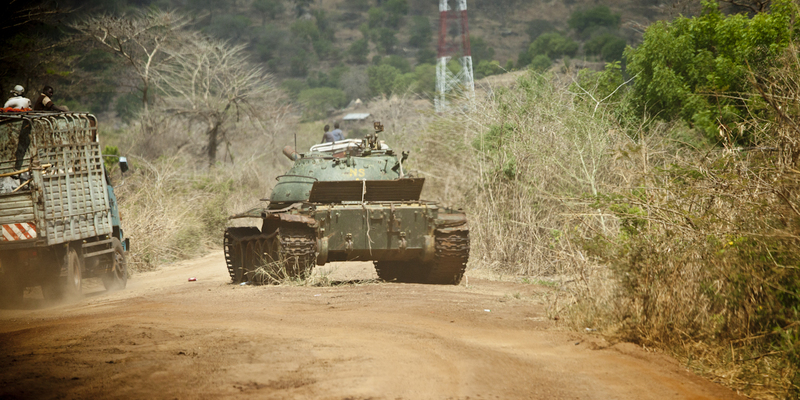 Consequently, it’s never wise to travel between villages at night, and you should always have other vehicles in sight. Once when we were driving, there had been a murder along the section of road we were on just a couple days before, and our driver was aware of it. For me, that was the scariest car ride I’ve ever had, not because of the murders but because of our driver. He was scared and drove at 70 miles an hour over washboard rutted dirt roads in a vehicle on airplane tires with broken power steering. We frequently bounced sideways as the vehicle bounced on its balloon-like tires. Yes, those are airplane tires on that truck. They’re going to have to unload everything to get that truck out. I have to give a lot of credit to the skill of the people who regularly drive these roads. I’ve seen drivers adeptly weave their way through holes straight through the top of a bridge to the dry river bed below, as well as drive through ruts I was sure would make us have to get out and push. On the other hand I’ve also seen four-wheel-drive vehicles stuck up to their doors in mud, or sitting with it’s axle behind the vehicle. By now you’re wondering, “what is a buda buda”? A buda buda is a motorcycle taxi typically driven by a driver about twelve years old. He drives, you sit on the back. My advise is to not have a heavy pack on, or you just might fall off the back. My goal is not to paint a terrible picture, because it’s truly not. 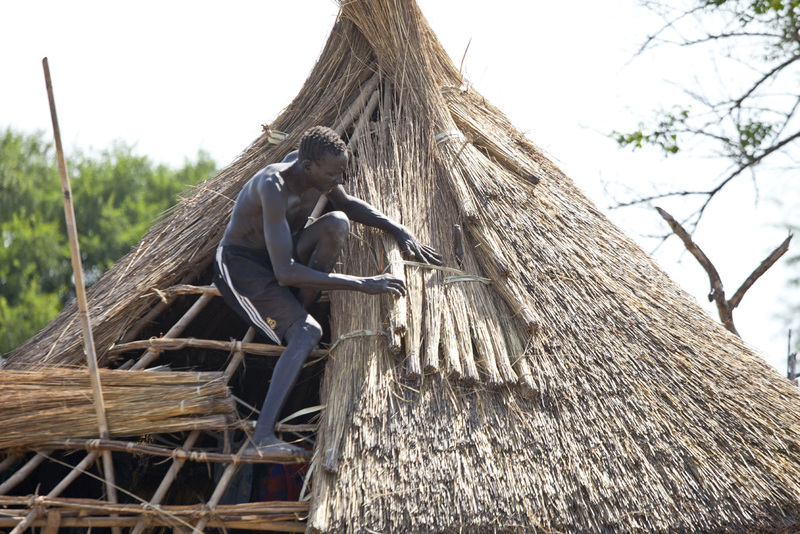 Travel in South Sudan is just very different from what you’re probably used to. It’s not for the faint of heart, but it is an adventure. For those inclined to that sort of thing who have the stomach for it, it’s an experience worth having. Otherwise I wouldn’t keep going back. 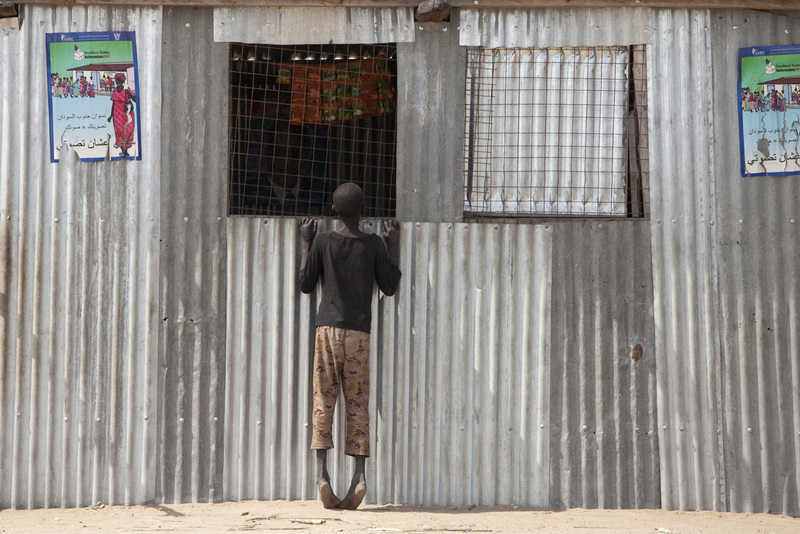 Buda buda drivers waiting for customers in Juba, South Sudan.